Last night I received a call from my son, Max. He sounded sad. 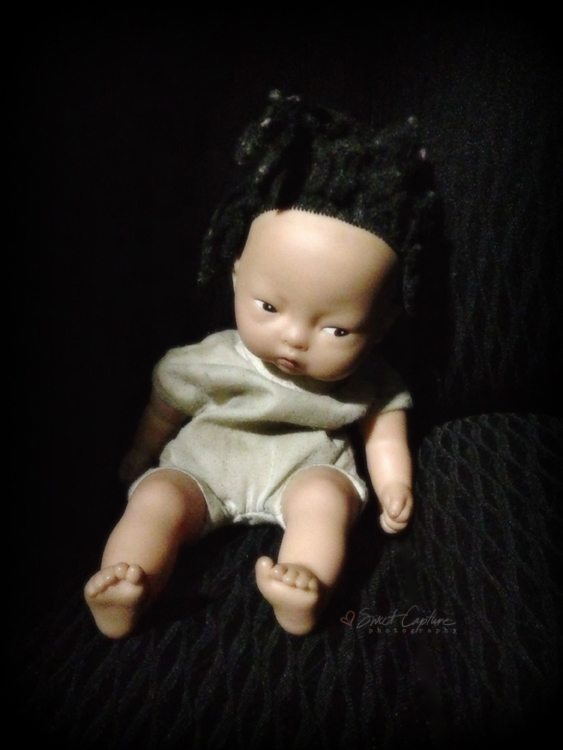 Gracie, his two-year-old daughter and my granddaughter, had lost “Baby Sad”, her favorite doll. Since I live closer to the grocery store where “Baby Sad” was thought to have been lost, he asked if I could try and find her. He had already called the store, but she had not yet been found. When I look at an old drunk and he smiles at me, I see a smelly, dirty person who probably wants money, and I look away. My kids see someone smiling at them, and they smile back. When I hear music I love, I know I can’t carry a tune and don’t have much rhythm, so I sit self-consciously and listen. My Kids feel the beat and move to it. They sing out the words. If they don’t know them, they make up their own. I wonder if we are given kids to teach or to be taught? No wonder God loves the little children! Author Unknown - Please comment if you know the author so credit can be awarded. Be ye fishers of men…You catch them – He’ll clean them. He, who angers you, controls you! Prayer: Don’t give God instructions just report for duty! At that moment, the great piano master made his entrance, quickly moved to the piano, and whispered in the boy’s ear, “Don’t quit. Keep playing.” Then leaning over, Paderewski reached down with his left hand and began filling in a bass part. Soon his right arm reached around to the other side of the child, and he added a running obligato. Together, the old master and the young novice transformed what could have been a frightening situation into a wonderfully creative experience. Perhaps that’s the way it is with God. What we can accomplish on our own is hardly noteworthy. We try our best, but the results aren’t always graceful flowing music. However, with the hand of the Master, our life’s work can truly be beautiful. May you feel His arms around you and know that His hands are there helping you turn your feeble attempts into true masterpieces. Remember, God doesn’t seem to call the equipped; rather, He equips the ‘called’. A nurse took the tired, anxious serviceman to the bedside. ‘Your son is here,’ she said to the old man. She had to repeat the words several times before the patient’s eyes opened. Heavily sedated because of the pain of his heart attack, he dimly saw the young uniformed Marine standing outside the oxygen tent. He reached out his hand. The Marine wrapped his toughened fingers around the old man’s limp ones, squeezing a message of love and encouragement. The nurse brought a chair so that the Marine could sit beside the bed. All through the night the young Marine sat there in the poorly lighted ward, holding the old man’s hand and offering him words of love and strength. Occasionally, the nurse suggested that the Marine move away and rest awhile. He refused. Whenever the nurse came into the ward, the Marine was oblivious of her and of the night noises of the hospital – the clanking of the oxygen tank, the laughter of the night staff members exchanging greetings, the cries and moans of the other patients. Now and then she heard him say a few gentle words. The dying man said nothing, only held tightly to his son all through the night. Along towards dawn, the old man died. The Marine released the now lifeless hand he had been holding and went to tell the nurse. While she did what she had to do, he waited. Finally, she returned. She started to offer words of sympathy, but the Marine interrupted her. “Who was that man?” he asked. Author Unknown - Please comment if you know the author. The brand new pastor and his wife, newly assigned to their first ministry, to reopen a church in suburban Brooklyn, arrived in early October, excited about their opportunities. When they saw their church, it was very run down and needed much work. They set a goal to have everything done in time to have their first service on Christmas Eve. They worked hard, repairing pews, plastering walls, painting, etc, and on December 18th, were ahead of schedule and just about finished. On December 19th, a terrible tempesta driving rainstorm hit the area and lasted for two days. So when the road you’re traveling seems difficult at best, just remember I’m here praying and God will do the rest. When there is nothing left but God, that is when you find out that God is all you need.